A Missal is necessary for the celebration of the Mass: it is likely that each priest or altar would have had one. Flyleaf inscriptions record that this manuscript was acquired for Durham cathedral through Prior John Fossor (1341-1374), and that it was kept at the altar of Sts. John the Baptist and Margaret in the Chapel of the Nine Altars. 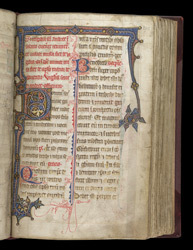 The Sanctorale of a Missal usually starts around the feast of St. Andrew (30 November), roughly corresponding to the Temporale, which starts three to four weeks before Christmas.